9 carat Yellow Gold Floating CZ Stones Open Heart Earring Studs (pair). CZ set White and Yellow 9 carat Two Tone Gold Fancy Earring Studs (pair). Pack of 6 pairs of 9 carat Gold earring studs in boxes. Coloured CZ stones assorted earring studs set in 9ct Gold with 9ct Gold Butterfly backs. Heart shaped Pink Sapphire set 9ct White Gold Earring Studs. Double Heart Sapphire set White Gold Ears Studs. 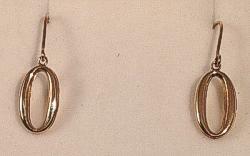 9 carat Gold Oval drop earrings (pair). 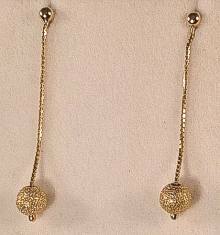 Glitter Ball long dropper earrings in 9 carat yellow Gold, 40mm long. 9 carat Yellow Gold Glitter Ball design brilliant 5mm size Ear Studs (pair). 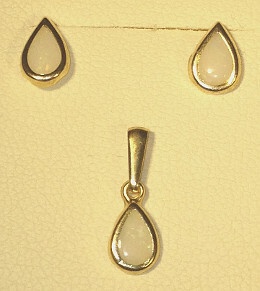 9ct Gold Ear Studs and Pendant set with Tear Drop shape 6mm Opals. Set includes pair of studs and Opal Pendant. 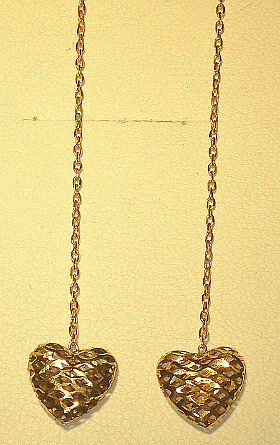 9 carat Gold Extra Long 95mm threader Triple Heart design pull-through Earrings. 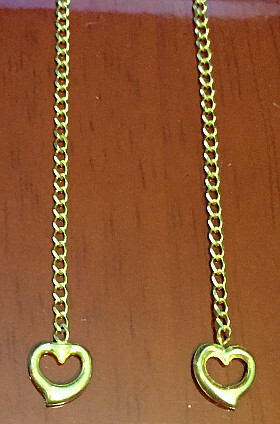 9 carat Gold hollow Filigree Heart threader style 58mm drop Earrings. 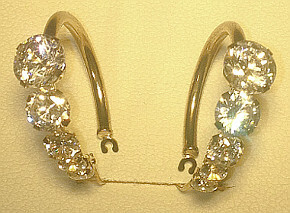 9 carat yellow Gold Pull Through 75mm length drop Open Heart earrings. 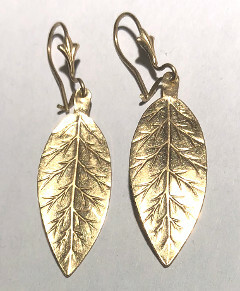 9 carat yellow Gold 40mm drop size Leaf design Earrings (pair).